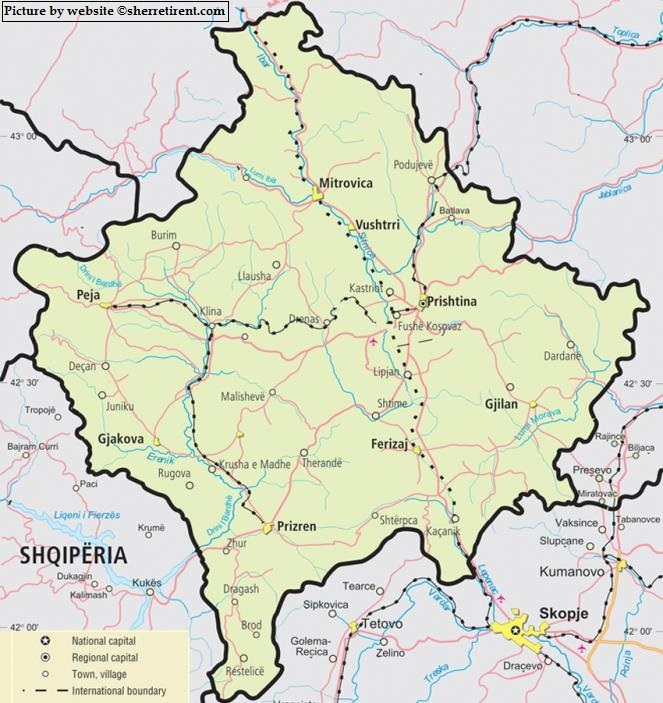 Are you looking for a Kosovo map? We show on this page two maps of Kosovo to give you a view of the country and its major cities. As you can see, the capital Pristina is situated in the East of Kosovo. Three other large towns, Peja, Gjakova, and Prizren are in the West of the country. The distance between each of these three cities is around 36 kilometers (22 miles). The distance between Gjakova in the West of Kosovo and the capital Pristina in the East is around 85 kilometers (52 miles). A ride by car or by bus takes around 80 minutes. As you can see on the Kosovo map, the neighboring country Macedonia has its capital Skopje very close to the Kosovar border. If you leave Kosovo via the south, you will enter Skopje very quickly. Other neighboring countries are Albania (to the left side of Gjakova and Prizren), Montenegro (to the left of Peja) and Serbia (North West of Kosovo). The names on this Kosovo map are written in Albanian. Sometimes you hear or read the Serbian name of a city, but most of the cities have just a tiny minority of Serbians. This is not the case in the Northern town of Mitrovica. Thousands of ethnic Serbians live in the Northern part of this city. Kosovo is divided in 38 municipalities. Ethnic Albanians are the majority in 27 of them. One has a Turkish majority and ten municipalities have a Serbian majority of inhabitants. All the places have both an Albanian and Serbian name. 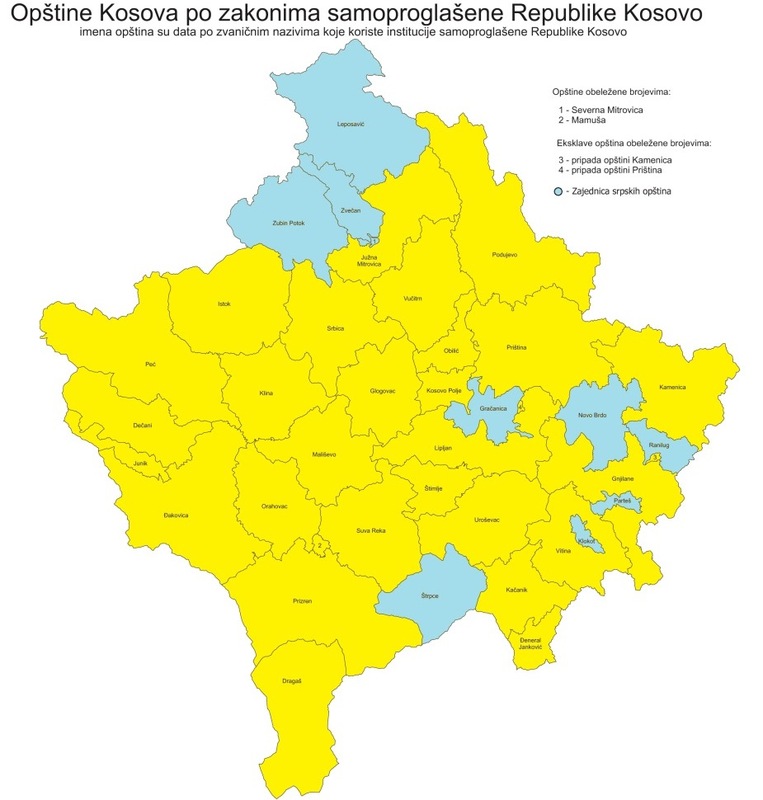 This Serbian map of Kosovo shows in blue color the municipalities with a Serbian majority. Interested in the location of Kosovo within Europe or the Balkans? Check Where is Kosovo. More information about the cities in Kosovo? Are you interested in tips for tourism in Kosovo or other practical information?